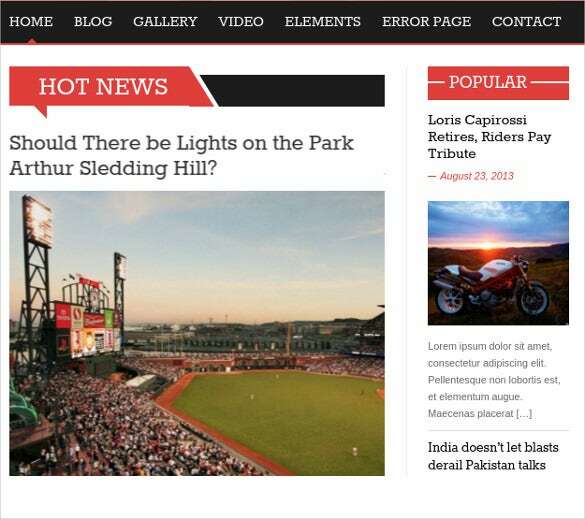 News websites are very common and web users stumble upon lot magazine and news information while browsing. 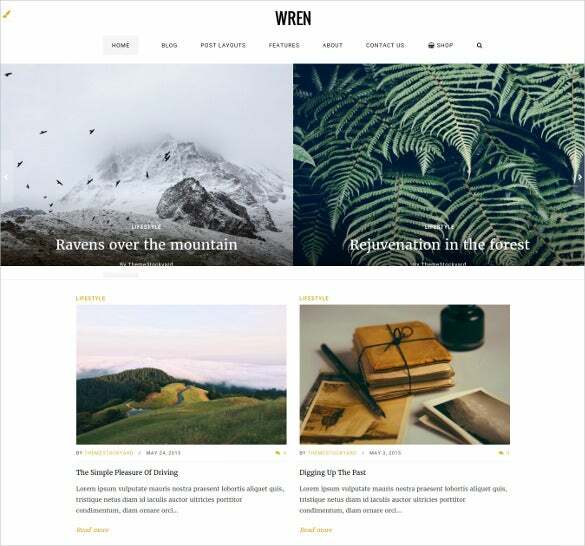 You need something different to catch the attention of your readers and these website templates give an extra dimension to your news websites with their pre-loaded features. 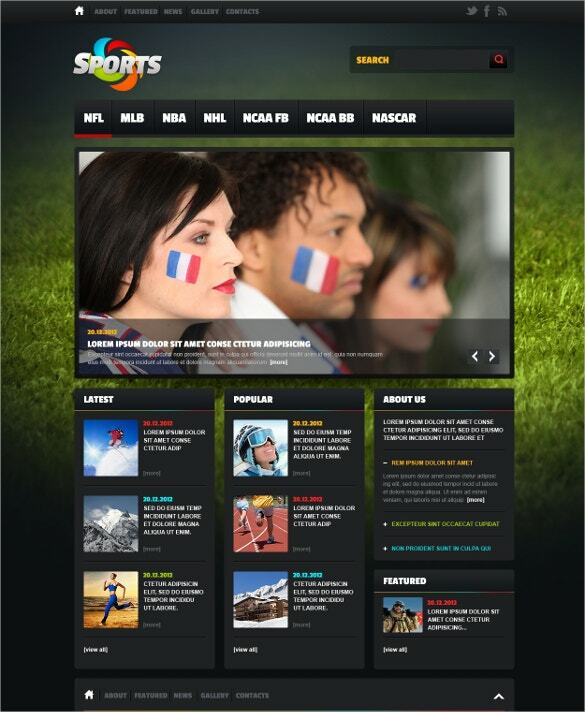 You can also see Easy Website Themes. 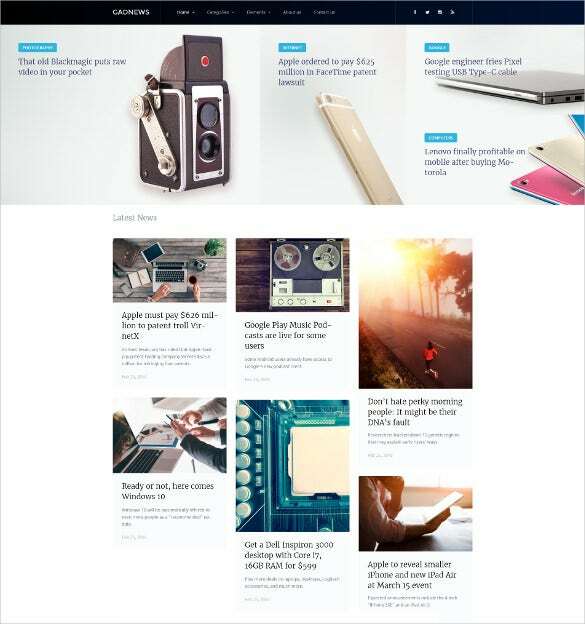 A professionally designed theme, Technology News Review WordPress Website Theme is one of the best options for a cutting edge news magazine website. 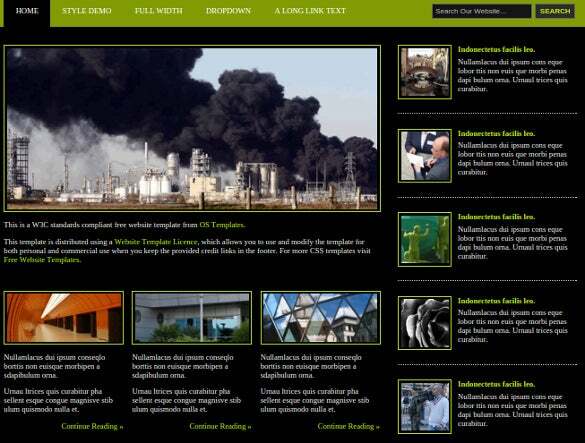 It has retina-ready responsive layout with which can be viewed neatly from all browsers. The theme here opens up with a big slider banner for the major news and the top of the banner includes the news on the line. Above it you have the menu bar and search bar. 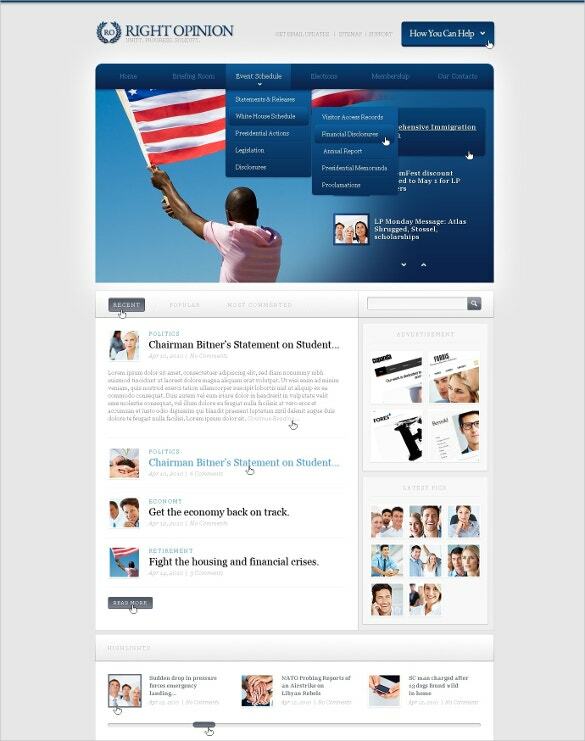 It’s a 100 percent responsive theme with free high resolution photos, back-to-top button & crossbrowser compatibility. 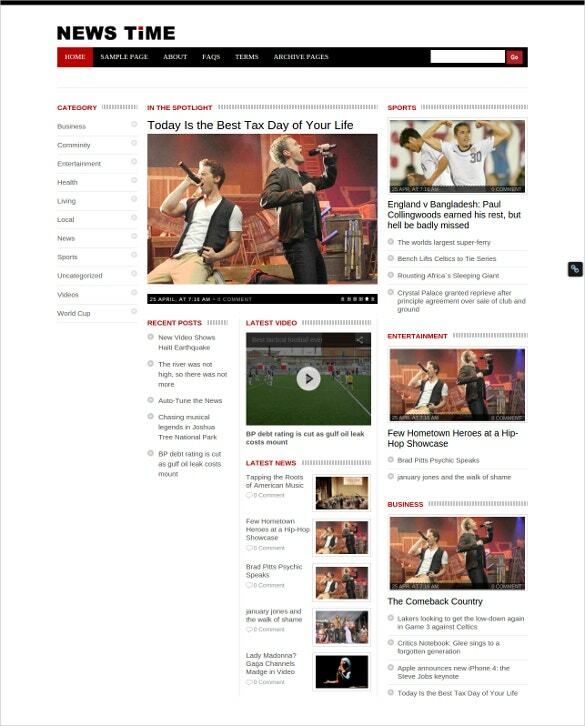 It’s a clean and neat news portal template where you have the major news or headlines in big at the left and the right side is about the different popular posts. The categories are on top. Crafted in Bootstrap, the theme is responsive, retina-ready and comes with 13 validated HTML5 files, crossbrowser compatibility & widget elements galore. 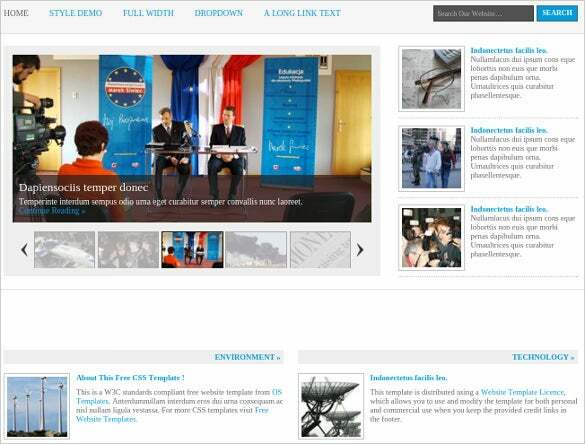 The smart theme opens with a banner containing the news headlines followed by a photo gallery and news on various categories. The right side lists the popular posts and you have menu & search bar on top. 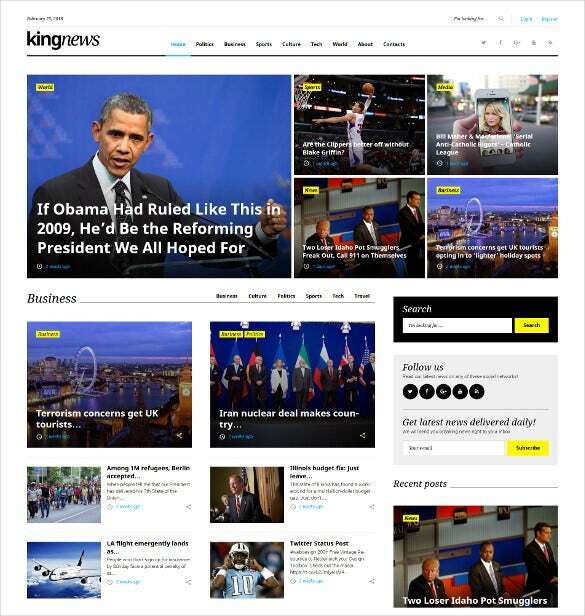 It’s a professionally designed theme and one of the best options for a cutting edge news magazine website. 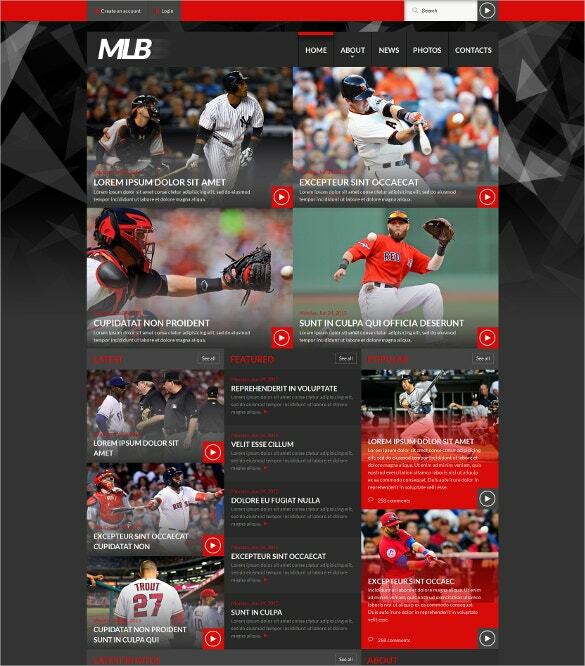 You are getting a professionally designed theme here which has got smart banners for headlines and below there are the latest news reports from various categories. The right side is on latest posts. It’s a retina-ready responsive theme which implies that it can be viewed smoothly from all browsing devices, regardless of the device size. 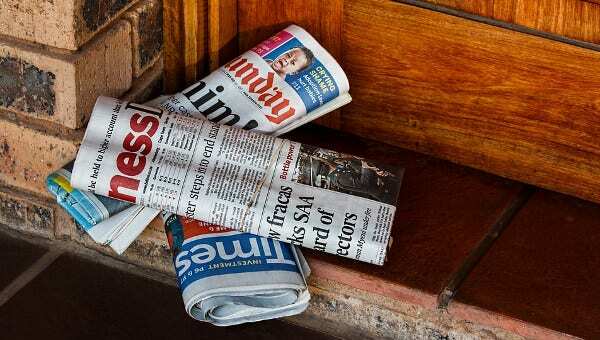 This no-nonsense news site template opens up with the headlines flaunted by the big banner followed by other important news reports below along with pictures. On the right, you have a list of recent posts. The search bar and menu bars have been placed right on top of the page. You are getting an elaborate news site theme here which starts with menu and search bar at the top, followed by headlines, categories and sections for most popular, most viewed, weather report and editor’s pick. 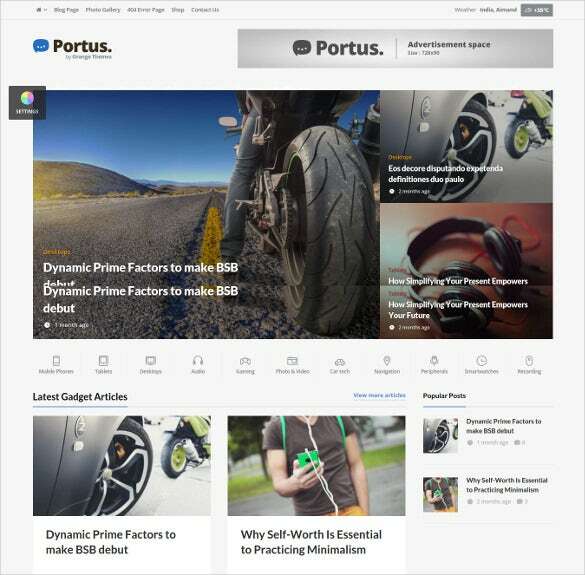 Built in latest web technologies like Bootstrap 3, LESS, Awesome Google Font, HTML 5 & CSS3, the theme is really powerful & flexible. 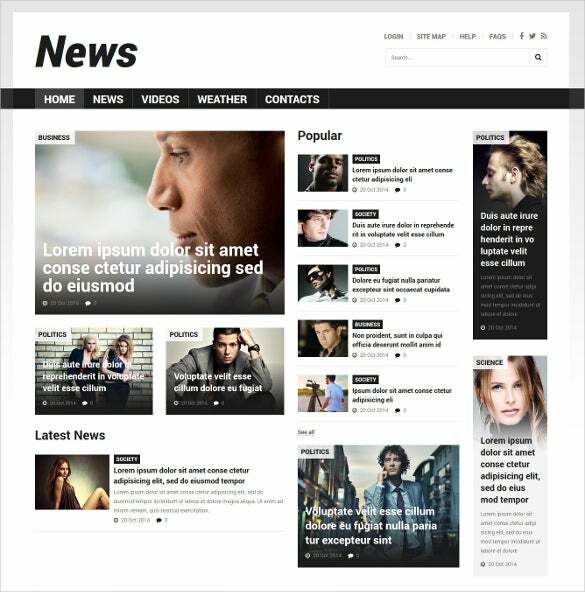 Opens with a banner containing the news headlines followed by a photo gallery and news on various categories, Newspaper & Blog WordPress Website Theme is a loved choice for designers. 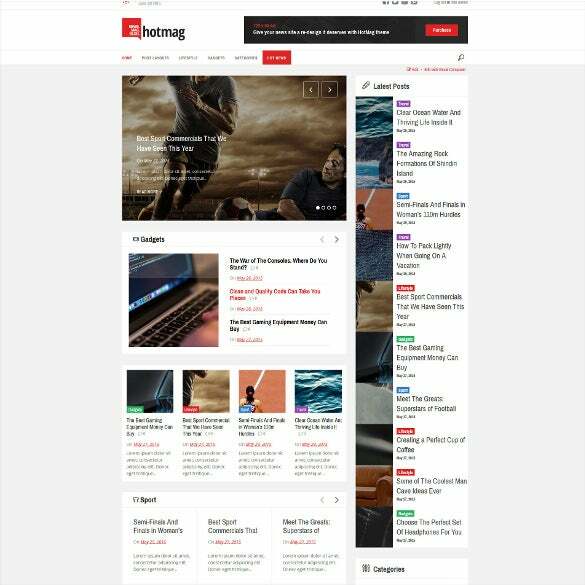 With Bootstrap 3, LESS, awesome Google Font, HTML 5 & CSS3, SEO rich content, social media integration and plenty of plug-in and widgets, Responsive Blog News & Magazine Website Theme is ideal for news or magazine portals. 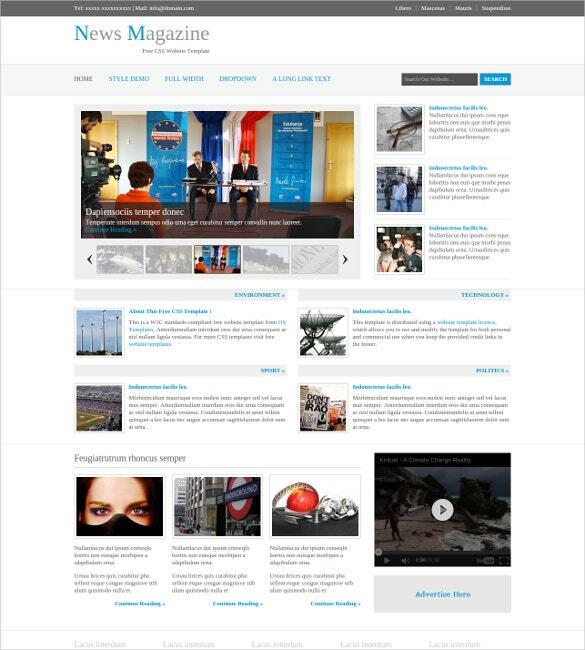 Create a neat news portal design with News Portal Responsive Joomla Website Template. It has HTML5 files, cross browser compatibility, retina ready images, SEO rich content, social media integration and plenty of colour and font options. 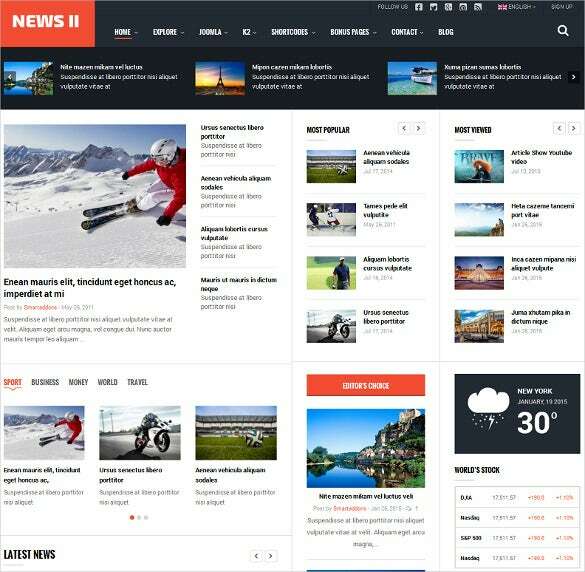 Bundled with responsive layout, flexible and widgetized coding, built-in review system, Bootstrap based framework, Premium News Portal & Magazine WordPress Website Theme is a loved option for news, magazine or blogging sites. 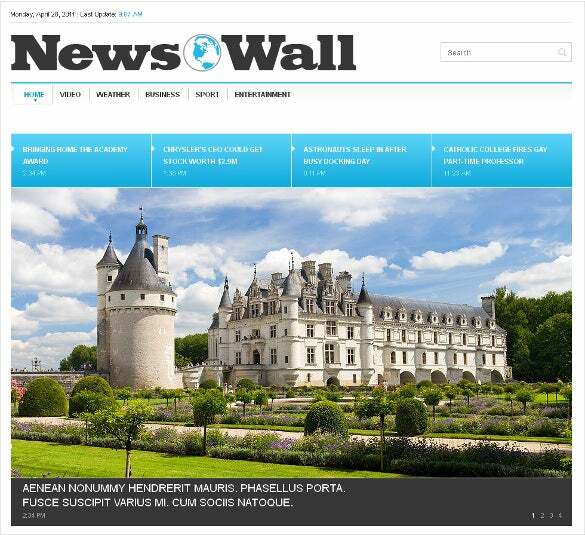 The most striking feature of these website templates are the features of content organization, where you can arrange the news according to the category. Enjoy great image presentation with its fantastic sliders; each template is fully responsive and is totally customizable and the dynamism of the website increases with the templates’ visual effects.